When I drink a wine from a place I've visited, an extra dimension of enjoyment happens as vivid memories of place, sight, sound and scent inform my perceptions of what's in the glass. While there's no substitute for travel, the growing availability of online mapping and satellite image displays can make the Internet the next best thing to being there. Why not use Google Maps online, the Google Earth application on your computer, or similar programs to take a closer look at the source of whatever you're drinking with dinner tonight? If you haven't thought about this already, most of you are probably handy enough with your computer to need no further instructions. For you, go, grab tonight's bottle of wine and go look it up. 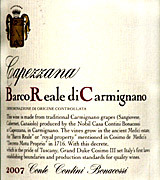 For the rest of us, let's illustrate a quick step-by-step with today's featured wine, Capezzana 2007 Barco Reale Carmignano, a Tuscan red from the smallish Barco Reale Carmignano district northwest of Florence. 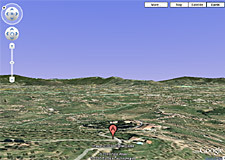 For starters, I simply opened maps.google.com and typed "Barco Reale Carmignano" in the "Search Maps" space. Presto, up came an airliner's-eye view of the village of Carmignano. Pretty nice! Want something even more specific? If the wine label doesn't list an exact address for the winery (many of them do), you can generally count on Web search engines like Google to help you find it. Sure enough, a quick search for "Capezzana Carmignano" dug up the winery Website, where I found the exact address, Via Capezzana 100, 59015 Carmignano Prato Italy. I set my Google Maps view to "Earth," plugged in this address, and ... whoa! Next best thing to being there! You can use the controls on the left to zoom in closer and view the scene from different directions, and pull the image itself around with your mouse cursor to take a spin down an Italian wine-country lane. That scene, by the way, is rich in Italian heritage. The property, long owned by the family of Conte Contini Bonacossi, originally incorporated the "Barco Reale," the royal property of the Medici family that famously ruled Renaissance-era Florence. The Bonacossi family's Capezzana is one of the region's top producers. According to the winery Website, "Capezzana ... has a very long and storied history. It is believed that wine grapes have been grown in the area surrounding Capezzana (called Carmignano) for over 3,000 years. Written records of the present vineyards date all the way back to 804 A.D. The property was named Capezzana during Roman times." Carmignano was the first Italian region (in 1975) to require Cabernet (between 10% and 20%) blended with the dominant Sangiovese, along with up to 20% Canaiolo and 10% Trebbiano at the wine maker's discretion. Barco Reale di Carmignano is a DOC created as a second wine to Carmignano, usually made from younger vines, in much the same way that Rosso di Montalcino is a second wine for Brunello. My tasting notes are below. By happy coincidence, just as I was preparing this column, my pals Steve and Deborah De Long, creators of the innovative Wine Grape Varietal Table, sent me a copy of the latest in their beautiful collection of quality, poster-size maps of wine regions. This one features Italy, and sure enough, there's Carmignano/Barco Reale (image above). The Wine Map of Italy includes all wine regions in Italy as well as adjacent wine regions in France, Switzerland, Slovenia, Croatia and Tunisia. 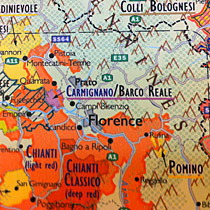 To order The Wine Map of Italy or any of the other De Long wine maps, click www.delongwine.com/wine-maps.php?PARTNER=WLP or call 1-888-240-7565, toll-free in the U.S. When I want to enjoy wine maps on paper, enriched with extensive information about the wine regions, wine people and wineries, my go-to volume is invariably Hugh Johnson's and Jancis Robinson's World Atlas of Wine, a massive volume filled with colorful detailed maps and informative articles by two of Britain's (and the world's) best wine writers. Hugh Johnson's and Jancis Robinson's World Atlas of Wine is available in hardcover from Amazon.com for $31.50, a saving of $18.50 (37%) off the $50 list price. The Johnson-Robinson Concise World Atlas of Wine in large-format paperback is $19.79 from Amazon.com, a $10.20 (34%) saving from the $29.99 list price. FOOD MATCH: It was fine with a vegetarian tomato sauce for spaghetti, fashioned from fresh San Marzano tomatoes mixed with a quick saute of minced onions, green peppers and garlic, and yellow summer squash sliced paper-thin. Its full and rustic structure, though, would frankly serve even better with rare red meat. VALUE: Fine value in the middle teens. WEB LINKS: Here's an article about Capezzana on the importer's Website. The winery Website is available in Italian and English. Here's an English-language fact sheet on Capezzana Barco Reale di Carmignano. Look for vendors and check prices for Capezzana Barco Reale on Wine-Searcher.com.